Read all text to assure you have the perfect rental for your needs BEFORE booking. * We are Mission Beach residents and personally greet you upon your arrival and give you the lay out of the rental and information about our community. We are located in a Quieter combined neighborhood community of Vacation Rentals and Residents. We respect our community and their right to a peaceful neighborhood. Should you want a place for gathering of friends other than the listed guests on the contract, another choice may be a better suited for your vacation. If you are looking for an amazing home for your family or guests listed on the contract, this will be a wonderful choice. This is paid directly to HomeAway and is separate from our pricing. ~A contract will be sent direct from owner/Manager to you and must be completed and returned directly to owner/Manager before any reservation will be confirmed along with a copy of government ID. The person booking the site, must match the payment name, and match one of the names on the contract an ID in order for this to be accepted. We will not accept reservations made for a different party that the requested name on the request to book on HomeAway/VRBO does not match. This is due 48 hours after the reservation is booked. We are the owners and offer our charming and spacious 1 bedroom waterfront beach rental which is located right on the peaceful bayside beach sand bayside. Welcome, please take a moment to read the entire description as it will provide you will most all information you will need as well as the rest of the website information. This lovely one bedroom beach front bayside vacation accommodation is perfect for the single traveler, a couple or a small family with 1 or two very small children. It best suits vacationers who want a more low key vacation in a more mellow area of Mission Beach. Kids can play all day on the beach, then have the quieter evenings for sleeping after that long day. We do offer monthly rentals, January and February. We do limit monthly rentals in our one bedroom, to 2 guests. Watch the glorious sun rise from your own private patio. Catch Sea World's Summer evening fireworks as sit on your own private patio. Our large one bedroom is uniquely set in Mission Beach which is located on scenic Mission Bay. Step out your waterfront patio door right to the sand and walk barefoot along the shoreline. Put on your skates, hop on a bike or leisurely walk for miles on the boardwalk located along the water. You can rent almost any thing you need with in a 5 minute walk. World class surfing, sailing, golfing, and fishing are all easily accessible from your beach front accommodations. The Dunlin, is owner managed while being kept welcoming and impeccably clean. We add that personal service which our regular travelers have come to welcome by personally speaking to you for your reservation and greeting you upon your arrival. Best One Bedroom on the Beach - The Dunlin: You can easily park your car and not drive till you are ready to travel home. If you are looking for that beach experience, come and discover the uniqueness of Mission Beach in the heart of America's Finest City, San Diego. Dish soap, paper towel roll, laundry soap, plastic wrap, aluminum wrap, some spices, some assorted teas just name a few of the extras for your convenience and pleasure. The Dunlin, has cable flat screen television in the living room, DVD and wireless internet service. All fresh crisp cotton linens and bath towels are provided with 4 pillows on your comfortable queen bed. Beach towels and beach chairs are provided to ease your load and get you ready for your days in the sand. Your comfort and enjoyment always in mind: - This lovely one bedroom is decorated with bright colorful shades to reflect our amazing weather and climate to remind you that you are on vacation in San Diego. -The bedroom comes with a deliciously comfortable queen maticulously clean with fresh crisp cotton linens for your pleasure and a great nights sleep. -The full sized sofa opens to accommodate max one extra adult guest or two young small children. -The Dunlin's living room glass doors open out on to the beautiful amazing beach and waterfront. Your view is beach front and on the water. At your door step or minutes away are all types of activities such as swimming, sailing, snorkeling, surfing, fishing, golfing, hiking, skating, riding bikes, reading quietly on the beach, museums, the World Famous San Diego Zoo and Wild Animal Park, Sea World and shopping in La Jolla, the pearl of San Diego. There are endless possibilities for you and your family in San Diego. We pay attention to details in providing for your rental needs. Location, Location, Location - The Beach: You are walking distance to waterfront dining, or casual beach eateries. You can easily shop for groceries, and plan your own picnic or romantic meal while sitting at the beach and watching the sunset on the glorious Pacific Ocean. Mornings are breath taking as you wake up to the sunrise across the water from your own patio table. Sip your coffee or tea as you watch the the first glimpses of dawn across the water and relish the quiet and peace that is all your own on the bay front. Its always best to call as well as email and offer a phone contact so we may make contact with you as well. We offer lovely rentals and want to find the best fit for your needs as a whole. Small personalized friendly service is a our business motto. We are individuals who own and manage vacation rentals for ourselves and a few neighborhood properties. With a long time family history in San Diego going back to the turn of the century, combined with roots from the midwest, we have both pride in San Diego, and good old fashioned values. The rentals showcased on this site, reflect, our goal to provide you with quality accommodations, along with personal service from the start of your reservation process, to your final departure. We like to think we attract vacationers who appreciate receiving the exact rental that is advertised on our websites and desire a well maintained vacation home or rental that much care has been taken to provide. In return, appreciate and care for the rentals during their stay. The environment we provide and the bayside in Mission Beach is perfect for low key vacationers, who want an amazing location on the waterfront and coast. 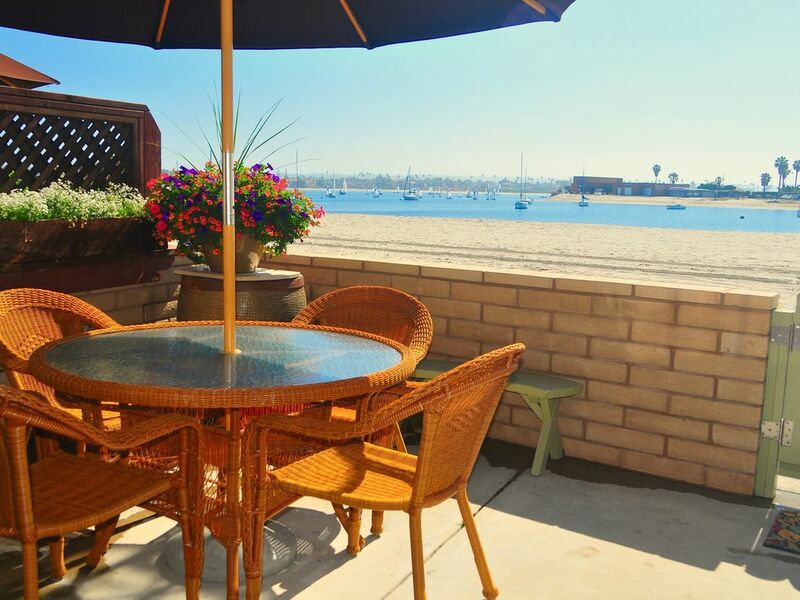 Location in Mission Beach is the key to the perfect beach experience. If you are looking for a quieter experience, the bayside beach is the best choice. But you can easily walk across to the ocean front and experience the ocean and its glory. When you want to shut down the excitement and noise of the ocean front, you can come home to the bayside. Our summer season, Memorial Day to Labor day rentals, is suited for families who want to enjoy a low key atmosphere. Summer group gatherings which are popular in some rentals, would not be suitable for this property. 1. On site owner/manager 2. Waterfront so you never have to leave the beach 3. Restaurants and cafes nearby 4. A well managed and cared for, vacation rental 5. Personal Service from the reservation process to greeting you upon your arrival and nearby for emergencies and to assure your stay is wonderful. 6. And no unpleasant surprises where by your rental is exactly the clean well maintained home you wanted. The Dunlin has a full bath, with a separate sink and toilet/tub shower area. Yes, the beach is your front yard. The Bayside is ideal for families or someone wanting a quieter place to spend at the beach. You are right on the beach bayside. We provide top quality linens for both the bed and the bathroom. Your living room looks out on the beach and waterfront. We do not offer a mechanical dishwasher. But we have all other appliances. And our kitchen is fully stocked to prepare any meal. We have a few items to get you started. Fully stocked with all you will need. Fully furnished for your stay at the beach. Your private patio opens up to the beach and bayside. Torrey Pines Golf is only a short drive up the coast. We welcome singles, couples and small families. Our rentals are located in a quiet area of the beach bayside, perfect for young children as well. We are a owner manger run vacation rental business. We have been providing excellent service to vacationers for 25 years and enjoy our work and look forward to providing you with clean and well maintained rentals on the waterfront in fun and beautiful San Diego. All of our rentals are impeccably clean and well maintained for your arrival. We offer personalized service and like to speak to all vacationers before accepting a reservation to see if its the right location for you. We also greet all vacationers upon arrival in order to make for a smooth start to your vacation. Come stay at the mellow bayside beach, but when you are ready for lots of action, you need only walk 150 steps to the ocean front side. Our rentals are also pet and smoke free for people with allergies to those factors. The apartment was nicely appointed and the owners helpful and friendly. It was all good ! Highly recommend the area for a visit to San Diego! Wonderful, safe and friendly area! Thank you Cyndi and Gary for being great hosts! A very comfortable and relaxing stay! Nice quiet location on Mission Bay with a lovely private patio. This apartment was clean and airy, quite comfortable for a couple, with a well equipped kitchen, good TV, fast internet service, beach chairs, umbrella and towels. Having a washer and dryer available was a bonus. The manager, Cynthia was most pleasant and responsive. What a wonderful place on Mission Bay. We arrived Christmas Day. Cindy met us and showed us everything. She is a wonderful host! The unit is steps from the bay and has a beautiful walking path by the patio. We spent every morning on the patio, eating breakfast, reading and relaxing in the sun. Pacific Beach is a short (100 yards) walk away with a beautiful boardwalk along the ocean. You are also close to Belmont Park, shops and fun little restaurants. There is a Ralph's supermarket close by as well. This unit has everything you need for a vacation. If what you need isn't there, you don't need it. The bedroom is large with a comfortable bet and a large closet. We are making plans for a return visit in 2020 with our granddaughters. I have used VRBO on numerous occasions. All have been really good but this was the best by far. Beautiful and quiet beach retreat! Excellent accommodations in an area with so many restaurants within walking or an easy drive. The Sand is right outside your front door. We are owner manager of this wonderful one bedroom, The Dunlin. Our spacious one bedroom beachfront bayside vacation rental is located ground floor right on the sand and waterfront. Mission Beach is unique as it is located between two bodies of water. One one side you have the serene and peaceful Mission Bay, while just 75 yards away, you are standing on the wild Pacific Ocean. There are miles and miles of shoreline on both side for walking, running or just exploring along the waters edge. We are located close to Sea World, the San Diego Zoo, Mexico, La Jolla also known as the Pearl of San Diego. Whether your tastes run to a relaxing vacation or one filed with activities and sightseeing, San Diego will not disappoint you. Our vacation rentals are owner managed and we take great pride in providing a great stay for you. EMAIL via Site, "ask owner a question," BEFORE SELECTING, "REQUEST TO BOOK" this assures we communicate to assure that we are not working with another vacationer at the same time. ~Rate charges are: Rent City Hotel Tax Cleaning fee Refundable damage deposit $500.00 There will be an administration fee added HomeAway Service fee is separate from our charges. ~We send a contract from our business email address and ask that any guest 18 years and older read the contract and initial ~We speak with each vacationer before accepting a reservation to assure you have choice the right rental for your needs. ~We ask that you read the enter website before requesting to book, so you are aware of the information.